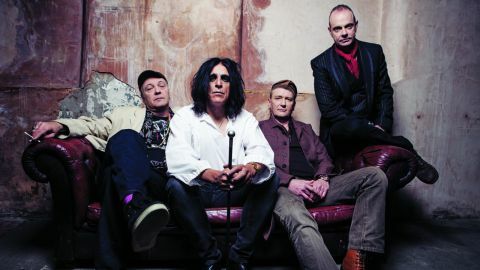 Driven by impulses and beliefs more urgent and profound than most bands could credibly lay claim to, Killing Joke have been so powerful for so long that you may wonder why there aren’t more bands as distinctive and daring as this. Their 16th album since erupting from the London suburbs in the late 70s, Pylon is only predictable in the sense that it is an exercise in brilliant business as usual. In every other respect, Jaz Coleman and his comrades’ latest exorcising of apocalyptic demons is as potent, distinctive and exacting as any in their canon, exhibiting the same formidable character, thrilling freshness and venomous verve that fans will be expecting, while once again throwing up a brand new take on the band’s undying post-punk template. For metal fans, Pylon represents the best entry point into the world of Killing Joke since the Dave Grohl-augmented eponymous album of 2003. Heavier and more fervently riff-based than anything they’ve done since that, or perhaps even 1990’s peerless Extremities… album, these songs use those essential Joke components – Geordie’s unerringly incisive riffs, Jaz’s cosmic, counterculture sermons – as a starting point for some of the most aggressive and dark material this band have ever produced. Opening one-two Autonomous Zone and Dawn Of The Hive set out the stall: pummelling, insistent and subtly epic, those trademark, haunting melodies glide majestically across a thunderous undercarriage of driving, jagged discord, drummer Big Paul Ferguson’s powerhouse delivery sounding more intense than ever and bassist Youth’s dub-centric bottom end rounding out an otherwise abrasive squall with a dash of subterranean substance. Even better is New World War: perhaps the most terrifying song Killing Joke have written since their very early days, and a gleaming gauntlet thrown down at the feet of today’s swarming mass of cookie-cutter try-hards. The main chorus riff is an object lesson in evoking arcane tensions and restless magic, with its angular, escalating note sequences and Jaz’s ferocious howl combining to suggest the impending arrival of total devastation and defeat for humanity. And yet, despite the very obviously grim lyrical overtones, Killing Joke still have the funk; like much of Pylon, New World War is propulsive and compulsive in equal measure: dance music for the end of days, perhaps, or the sound that emerges when the dancefloor splits in two to reveal the beckoning abyss. There are more subtle moments here too, ranging from the sublime hooks and succinct swagger of Euphoria and Big Buzz to the oddly uplifting call-to-arms of New Jerusalem, but those pitch-black shadows are never far away. Closing with the vein-popping tirade of I Am The Virus – a strange choice of first single for a lesser band, but the perfect calling card for Pylon’s monstrous spirit – and the sweeping squall of Into The Unknown, this is another demonstration of idiosyncratic prowess from a band that have seldom been less than a necessary part of our world. The current is flowing: plug yourself in and wait for the world to shatter. YOU SEEM TO HAVE MORE POSITIVE ENERGY THAN THE KILLING JOKE OF OLD. IS IT A REACTION AGAINST A MORE NEGATIVE WORLD?